I really need to start Jenna’s Harris Shrug, (which I will be starting later today, I can’t wait to begin this project!) but in the meantime I had an idea for a cup cozy, and I built a light box yesterday for taking photos and I really wanted to try it out! I had so much fun building this light box, but I will write about that soon. 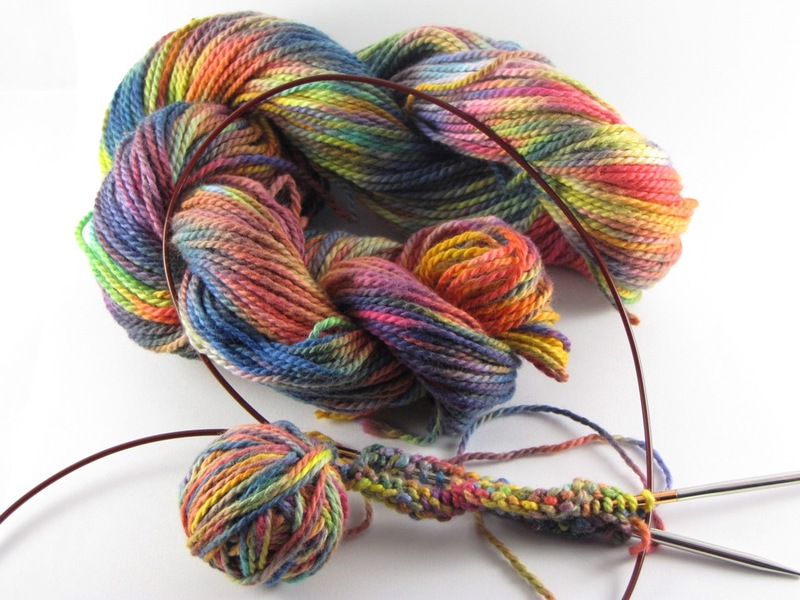 I have knitted this cozy in Colourspun DK cotton, I love the rainbows! It’s an easy pattern, knitted in the round part of the way and then flat. 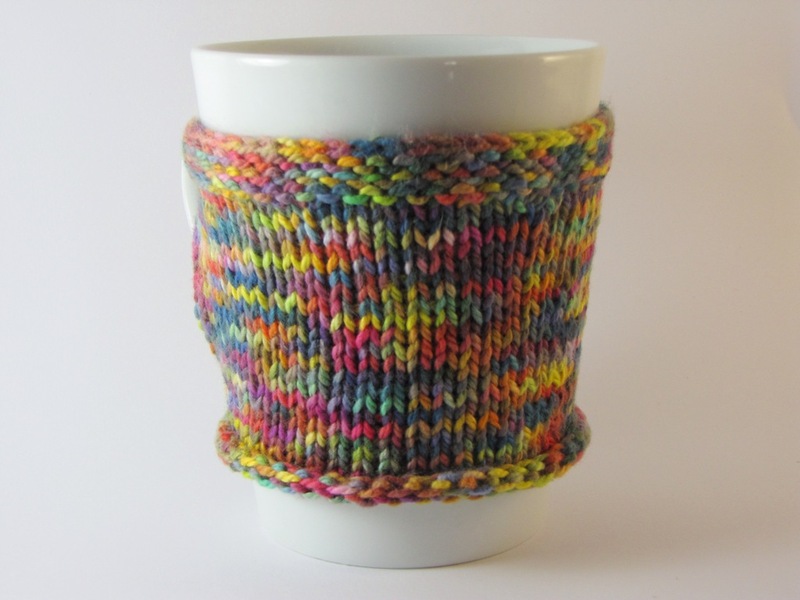 Cast on 46 stitches and join for knitting in the round. Knit 5 rows in the round. Now, to make the opening for the handle you will no longer be knitting in the round, but rather back and forth as for flat knitting. Rows 6-24: You will be knitting back and forth on your rows, not in the round. Alternate purl and knit rows, starting with a purl row and ending with a purl row on row 24. 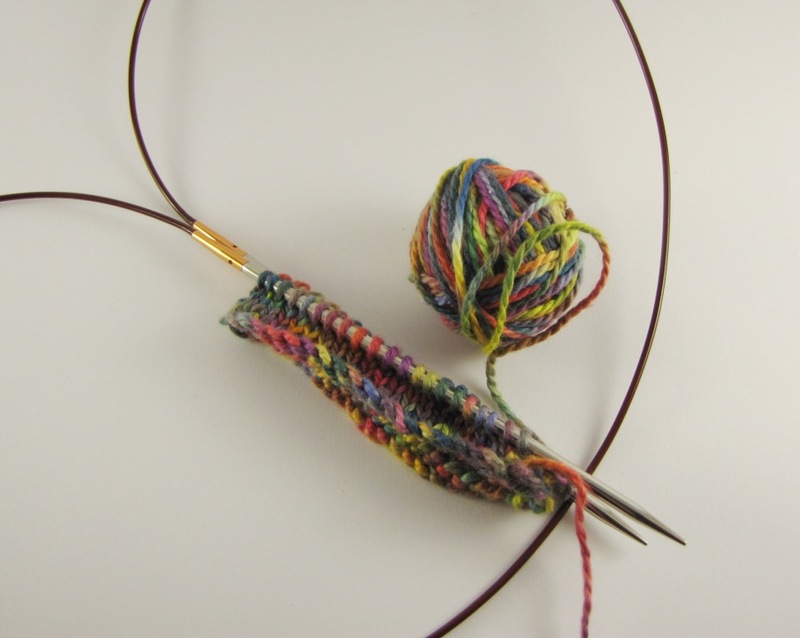 Eventually, as you progress along the rows, you will manage to have all the stitches on one needle. 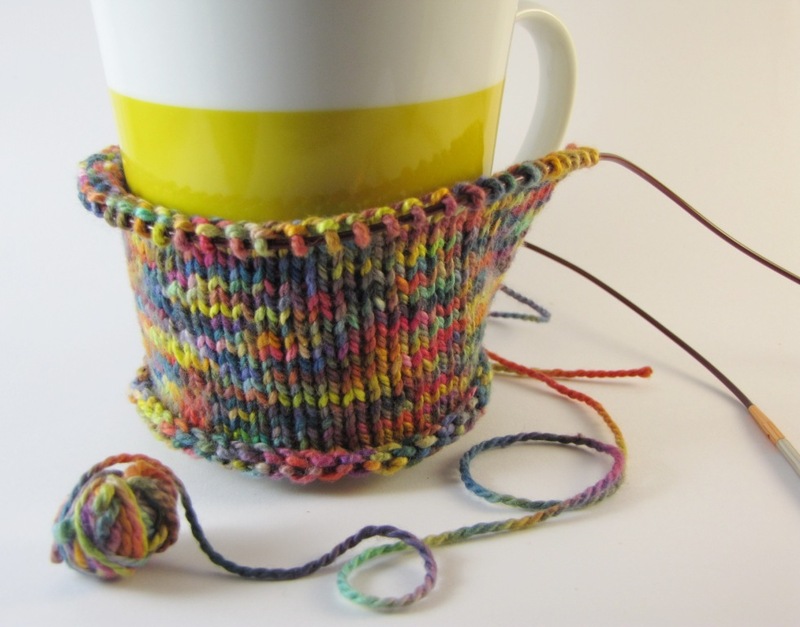 Measure your cozy around the cup a few times to make sure it fits. 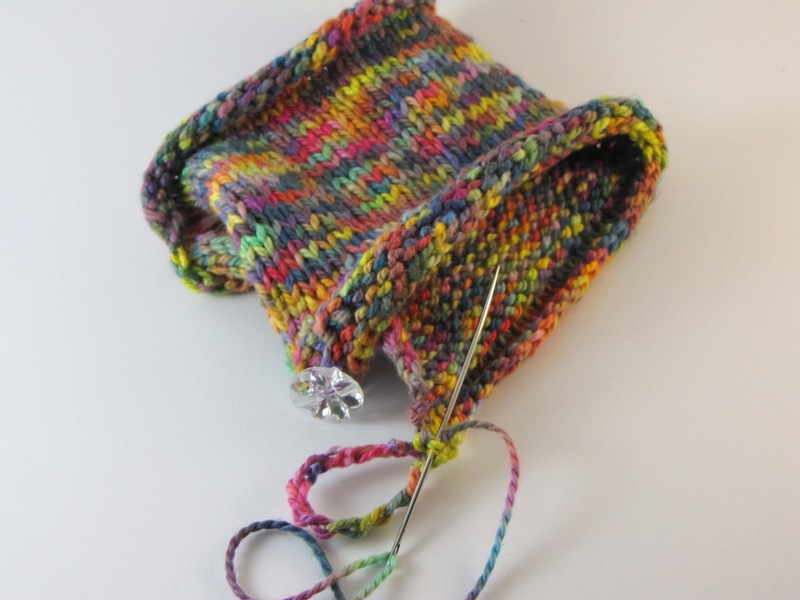 Row 25: Knit row and increase four stitches evenly across the row. To increase without being able to see the increases, simply pick up a stitch between two of your stitches as seen in the photo above. Place this stitch on the left needle. 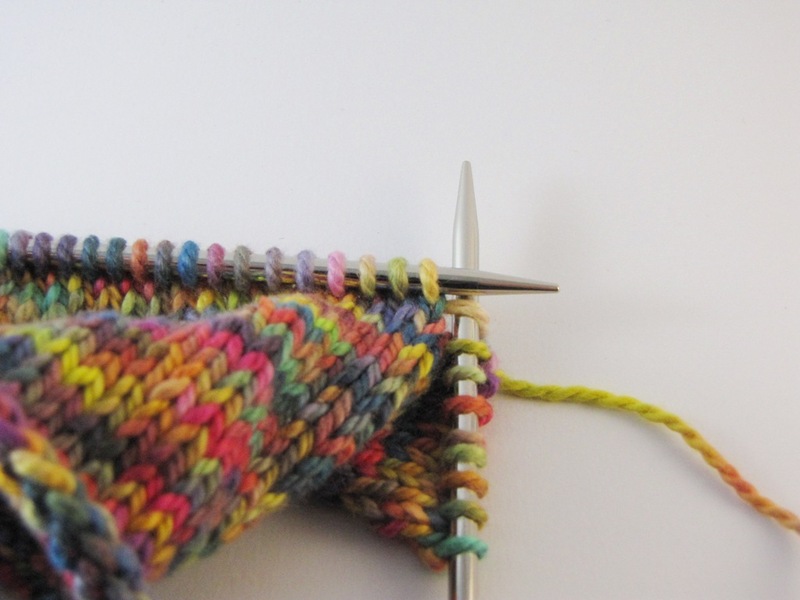 Rows 26-30: Knit, this will give you an attractive edging. Sew on a button on one side at the top of the opening of the cozy. Sew in all the ends. 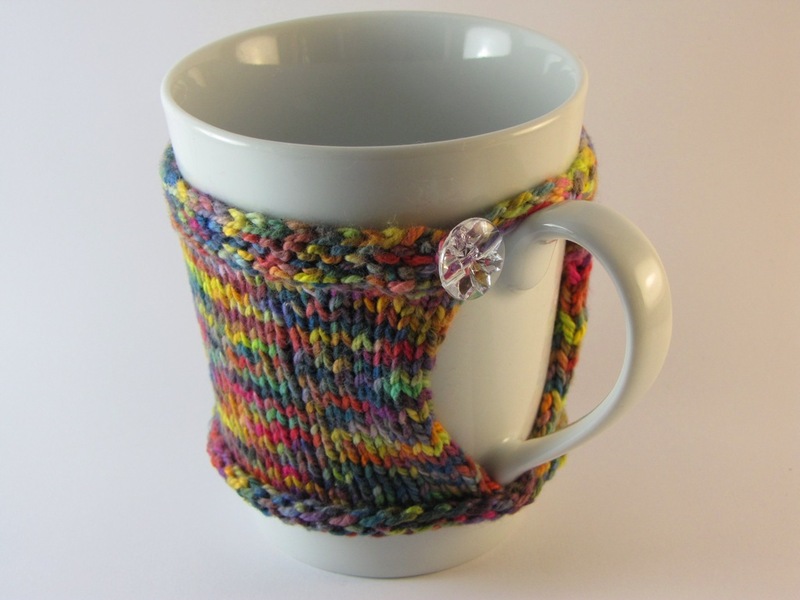 On the opposite top edge of the cozy crochet a small chain, attach and sew into a loop to button the cozy closed. Linda – nice to see the cup cozie. I have nt finished mine. I did it in a round knitting loom. Will post it shortly. Thanks for the pattern. what a lovely idea Linda! and thanks for the tutorial I will try it! Thank you so much for another lovely pattern! I will try it! It looks wonderful with the rainbow yarn! It’s such a cute pattern. Thanks! 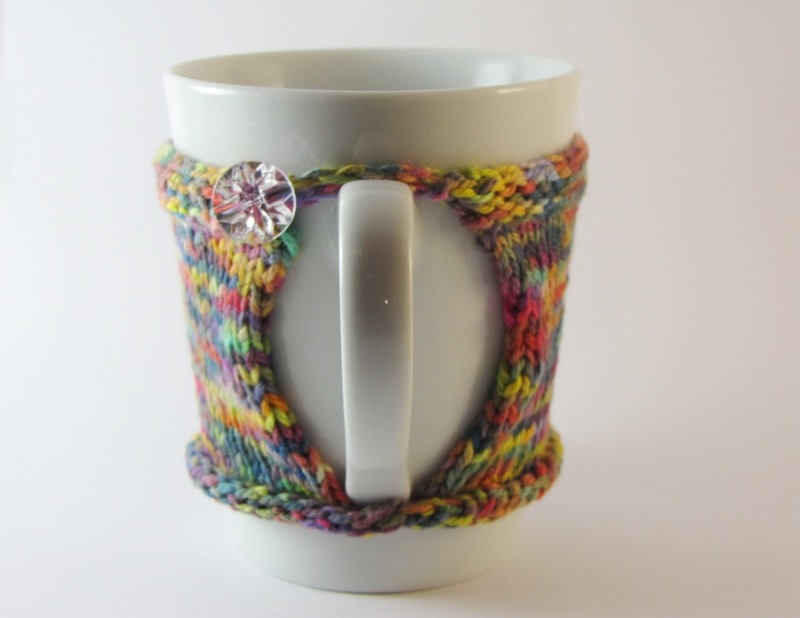 Very pretty cup cozy. Love the yarn that you used. it’s really very cute linda, and well done on the light box too! Love the yarn colors!!! The button is magical. You are always giving Linda. One way or another you are always giving……. Oh I love this! I have to go and knit one up for a few holiday gifts. Thanks for sharing. I am obviously an ammature compared to everyone else. I need help! How do you go from knitting in the round to knitting flat! Any suggestions? 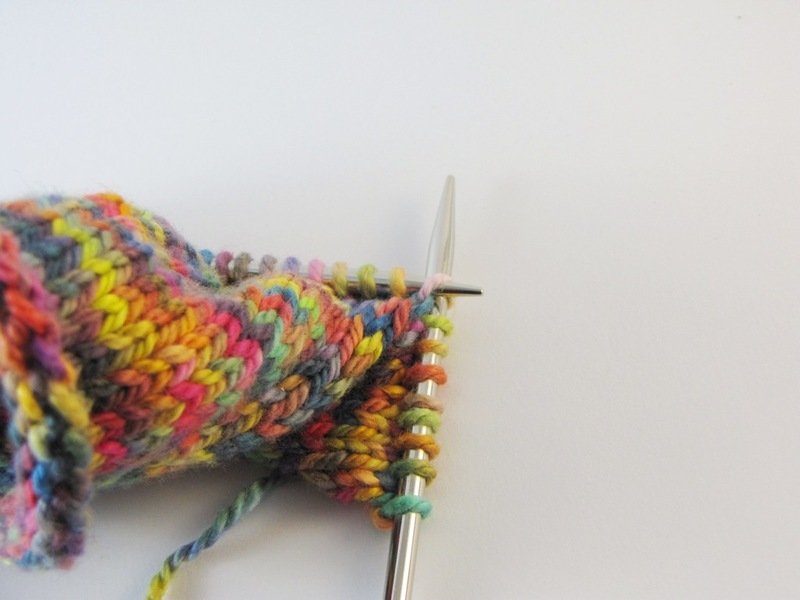 When you start knitting flat, just turn the work around and instead of knitting round, just continue in stocking stitch, knitting flat, purl on the wrong side and knit on the right side. Thank you for the help! I think I have it sussed I just need to practice a couple more times. Thanks for the pattern/idea! I love the yarn as well! It is beautiful!